Tuesday October 1st: "Valley of the Kings - Burial Place of the Pharaohs" Peter Clayton. A survey of the major finds and history of the Valley. Peter Clayton, FLA, FSC, FRNS is an archaeologist who has excavated in England and Egypt. He has served on the Committee of the Egypt Exploration Society for more than 15 years. He is the author of "The Rediscovery of Ancient Egypt" and many other archaeological books as well as Guest Lecturer on Swan Nile and. Hellenic Cruises for 18 years. This is a lecture not to be missed. Thursday October 10th at 7.30 pm at Queen Elizabeth Hall, SE1. A concert by the City Waites of authentic London Street Music, 12th C onwards, played on authentic instruments of the period. The concert includes bawdy songs with audience participation. Tickets £7.50. Hendon, 11.30 am - 2.30 Please contact stallholders or Dorothy Newbury with your offers of cakes and jams, quiches for lunches, goods for sale, and offers of help (see last month's Newsletter leaflet). Tuesday November 5th: "The Rise and Fall of Roman London" - Dominic Perring. Saturday November 16th: LAMAS 26th Local History Conference at Museum of London, 11 am to 5 pm. For new members' information, HADAS lectures are held at Hendon Library, The Burroughs, at 8.00 for 8.30 start. Coffee available before the lecture. Members with cars please offer lifts home. Night travel on public transport keeps some members away. In the death on September 5th of Brigid Grafton Green, HADAS lost one of its most outstanding members without whose impetus, drive and enthusiasm it would still be a small local group instead of one of the premier archaeological societies in England with, in its heydey, a membership of over 450 with a degree in English and Logic from St. Ann's College, Oxford, writing skills honed by a career in journalism and as an author, Brigid not only took an extra-mural Diploma in Archaeology with Distinction but the Diploma in Local History as well. She then turned herself, with enthusiasm, to the business of "making' HADAS. Her flair for organisation was reflected in the exhibitions the Society mounted, outstanding examples being "the Battle of Barnet", "Archaeology in the Borough", "Archaeology in Action", "Pinning Down the Past" not to mention the innumerable small exhibitions at fetes, schools and archaeological conferences. Under her editorship, the newsletter went from strength to strength and established an admirable tradition of punctual publication. She galvanized the membership into producing HADAS Occasional Papers and without her diplomatic skills, many a dig (notably West Heath) would never have started. She never lost a trick to get HADAS into the papers and her publicity drives were always directed in the interests of the Society, never herself. It was not all work, though, she could organize play with the best of them as, for instance, the greatly enjoyed theme banquets - the Roman Feast, the Arabian Nights and the 21st Birthday party - when her Cordon Bleu skills came into their own. Brigid was a meticulous excavator and a fine researcher. She is going to be much missed and it is up to the rest of us to make sure that the Society flourishes in her memory. Brigid's funeral took place at St. Edward The Confessor Church, Finchley Road on Thursday September 12th. Our Vice-Chairman, John Enderby, gave a short address during the service. We are sorry that we could not notify her many friends in the Society, but several members were present among the congregation of over 100. HADAS friends of Brigid are contributing to the Phoenix Trust, an organisation for the advancement of reconstructive surgery which helped Brigid during her earlier illness. This was a suggestion by Brigid's family instead of sending flowers. Any HADAS friend who would like to contribute to her memory, should send to John Enderby, 19 Chatsworth Avenue, Hendon NW4 or to Dorothy Newbury. How lucky HADAS was to have the talents of Brigid Grafton Green for so many years. She was in every sense a remarkable woman and one of the best communicators I've ever known. How many writers, I wonder, could have constructed such a readable and enjoyable account of the first 25 years of HADAS such as that she wrote as a Preface to 'A Place in Time'. It's a minor masterpiece. Could I put two points to the Committee for their consideration? 1. That Brigid's life and work be commemorated by a special exhibition at Church Farm Museum. I understand there are some dates still available in next year's calendar. 2. That a BGG award be established for outstanding services to HADAS. This could be annual and possibly presented at each AGM. A small trophy or medallion (a miniature trowel?) might be appropriate with the whole of the membership given a chance to vote against a list of names decided by the Committee. One of the reasons I put this forward is that HADAS is blessed with many people who put in a tremendous amount of work on its behalf. Inevitably, this can only be recognised by the usual 'vote of thanks' on an appropriate occasion. An annual award would be a permanent reminder of BGG and a more tangible expression of the debt owed by less active members such as myself, to those who do all the hard work. On a beautiful sunny day, on August 10th, HADAS or at least 27 members set off by coach for Enfield. There we visited Forty Hall which was built for Sir Nicholas Rainton, who was Lord Mayor of London 1632-1633. The house was sold to other families and in 1951 it was purchased by Enfield Urban District Council. A seventeenth century Georgian house it is now a museum and has furniture of the seventeenth and eighteenth centuries, also ceramics and silver of the nineteenth century and children's toys and furniture of the nineteenth century. Members of Enfield Archaeological Society showed us some of their finds including a Roman lead coffin. We also looked at a Punch and Judy exhibition in the Great Hall of the house. Coffee was served in the converted stable block overlooking the courtyard, and we walked back to the coach through the magnificent grounds, laid out with woodland paths and beautiful lawns and past the lake. The coach then drove us to Hertford. "Make me an offer," he said. No, it was not an Eastern bazaar but a Viking in leather jacket and chain mail jerkin who was urging us to buy wooden drinking bowls, metal bracelets, and earrings, a Viking board game and other hand-made objects, which were spread out before him as he squatted on the grass. He had just fought a battle against the Saxons - and lost. The shields of the thirty or so contestants withstood heavy blows from axes, swords and spears and the women also engaged in the battle. At the end the field was strewn with the "dead". This was a demonstration by the Dark Age Society in Hertford, for their one-day archaeological fair on "Lighting the Dark Ages". In the main hall there was a demonstration by the Dark Age Society and the staff from West Stow Anglo-Saxon Village on craft techniques - knitting with one needle, hooked like a crochet hook, and metalworking. Stevenage Museum was showing replica coin striking, Kings Langley History Society were demonstrating spindle spinning, and other museums - St. Albans, Bedford and North Herts. - were selling books. Across the road in the Millbridge Rooms, there was a reconstructed Roman corn dryer, which had been excavated from the grounds of a local farm, and the conservation and restoration service had exhibits on display. Wooden swans which had been placed on a beam across the road from a public house were being repaired for the museum, and dolls' clothes were being re-sewn or replaced, china was being repaired and staff were on hand to explain and discuss. We went on a guided walk around Anglo-Saxon Hertford. In 913 AD Edward I had the northern fortress built, consisting of a ditch and a wooden palisaded bank between the rivers Mimram, Beane and the Lea. At one point the seed corn merchant, Mr. Barber, invited some of us into his yard to view the slope of the boundary bank of the fortress. Someone remarked on the holes in the roof of the barn, and he said these were for the cats ­to allow them entry in order to keep down the mice who might eat the corn: In winter they close the holes. He then showed us another one of the barns, and the beams with their expert dove-tailing and cutting showed exemplary craftsmanship. This was a spontaneous piece of archaeology - a definite plus. The ditch and bank of the fortress ended at the Castle Grounds where we sat and watched the river drifting along under the willow trees - much as it must have drifted for centuries. We came out of the Dark Ages with a better perspective of the time between the departure of the Romans and the establishment of the Saxons. Hertford developed as a Royal Burgh, with a Royal Castle and a Royal residence in mediaeval times and because of this became the capital of Hertfordshire rather than St. Albans. This was a day when archaeology was given flesh - it came to life in displays of craft techniques and in battles, and members of the Dark Age Society in authentic dress and walking around made it even more vivid. Everyone seemed impressed and once again we are very grateful to Dorothy for the planning and organisation. Good progress has continued to be made at Golders Green Road, although by the time these words are read the dig should be completed and the site backfilled. Eight trenches have been excavated in all, covering most of the 'promising' areas of the site, with most effort being concentrated on the area nearest to the main road. In this area all trenches have exposed similar stratigraphy - natural clay overlain by a thick buried soil layer containing much 17th-18th century pottery, clay pipe, and glassware. This is itself sealed by 19th century and modern soil interspersed with spreads of ash and clinker as a reminder of the forge. A few 18th-19th century coins have also been recovered. The major find in three tracks has been a fairly shallow sand/pebble feature tentatively identified as the previously elusive (at least until the last couple of weeks of the dig!) medieval road. Sadly, there are no finds from this layer; a preliminary study of the pottery from the site indicates that the earliest material from the site is c. 1550, from the soil layer sealing the 'road', the 'road' surface lies immediately above the natural clay. An interesting piece of modern history is that many of the forge buildings were flattened by the wartime V2 rocket that landed in the back garden of the adjacent pub, leaving a crater big enough for two London buses, recalls Mr. Flynn. Thanks are due to the site owner, who has been most helpful throughout; to the faithful HADAS regulars - Anna, Arthur, Bill, the two Brians, Joyce, Vicky, Victor, Fred - and to one or two welcome new faces (Hi, Dot) It is hoped to produce a full report ere long. We reached Grimes Graves on time and clambered down the steep ladder (plus hard-hats provided) to an amazing pre-historic mine. Some people would have liked to go into the side shafts now closed off - one felt sympathy for the original miners with their antler tools. Next morning, owing to Dorothy's diligence six packed lunches were discovered missing and we left 1/2 an hour late for Swaffham. However, we managed to see all we planned. Swaffham is a lovely little market town with a bustling street market, a lovely church - serving coffee in the nave - and a museum. On to Castle Acre, a little treasure trove in the heart of Norfolk. We were met by Robert Ricketts our excellent guide and walked round this lovely little village, castle, church and finally the Abbey ruins where we had lunch looking at the magnificent ruins of the Cluniac Abbey, and the complete building of the Priors Lodge which survived the Reformation as a farm house. Next on to King's Lynn where three guides awaited us and (in the unrelenting heat) we did a long walk round this fascinating town. My particular guide kept up a non-stop rallying cry of "No time for that most interesting street (church or whatever), can't see it now. Come again ..." And the breakneck speed was maintained, lovely old streets, old 16th and 17th century houses, almshouses and churches. I would certainly like to go back there. We ended up in St Nicholas chapel, surely the finest Chapel" in England, a magnificent late 15th century perpendicular building, about whose future there is uncertainty. The marvellous wooden angels in the roof so special to East Anglia, seemed to be pleading for help. Tea in Trues Yard, a preserved little fisherman's enclosure with tiny houses where large families were raised. The biggest surprise - the lady pouring tea was an Old Girl* of Hendon County School and anxious to speak to Hendonians - this is a small world: Back to U.E.A. and a formal dinner. Next morning farewell to the Brutalist architecture of U.E.A. and on to Caister, where Roman remains were visible but new houses have been built on most of the unexcavated site. Yarmouth was next and to many of us a revelation: We never even saw the sea. The old fishing town and port took all of our time and deservedly so. A fascinating guided walk took place. Yarmouth was an old walled city which still remains with a few city towers, "Tars" in local lingo, one still in situ. The old town in places reminded me of the Low Countries and indeed for centuries there was a great trade and interchange with the Continent, and the cycle of history has once more made it a flourishing port "on the right side of England again', said our guide. An excellent lunch was provided at the Star Hotel, then - not resting on laurels, on to Burgh Castle (in the middle of nowhere) and then to Blythburgh in Suffolk, surely earning its nickname as the Cathedral of the Fens. Again wonderful perpendicular architecture rising like a dream from the flat countryside. The finale of the weekend was a mind-boggling tea by the local W.I. who came and took a deserved bow at the end of our stay. Then off for home, safely delivered to NW11, MW,4 and N3. Our driver was marvelous, cheerful, clever with his vast vehicle, helping to serve food at the hotel, etc. and as for Dorothy, our thanks can never be enough for her matchless efficiency. (* Eileen Clamp, a pupil at Hendon County during the war. She went on to Manchester University and then married and moved to the Norwich area, where she taught and raised a family of 2 daughters. Dorothy would like to thank all the members on the above weekend for their appreciation of her efforts. But let's face it, the weather was perfect and she couldn't organise that. The witch's cottage is now in rather a poor state, and in use at present as a storage hut. The original infill not surprisingly dropped out when Gerald Gardner moved the building from New Barnet, and has been replaced by modern concrete, while the thatched roof was removed,because of fire regulations. Most of the timber framework remains intact, though some timbers appear to be relatively modern replacements. The door of the cottage is that which once adorned the St. Albans jail, the rest of which is privately owned in another location. Nothing remains of the arcane decoration on the walls. (My research would suggest that these were zodiacal signs representing the planets within a framework of a pentagram, and were presumably used as protective symbols gleaned from an old 'grimoire' or spell book. Several of these remain extant.) (8) A tiny part of the magic circle is still visible, but could not be viewed fully because of storage bags on the floor. The building as it now stands would appear to be of C16 or C17 date, and a letter from the Victoria and Albert Museum to Dr. Gardner seems to confirm this date: "It was, and is, of interest, not only as an example of an Elizabethan structure, but for the legend which had persistently hung about it." The signature of the letter is unfortunately illegible and it is dated 6.11.58. A copy now rests in Barnet Museum archives. The witch's cottage (now only about 5m long) seems to be only the central section of what was originally a larger building, as what appear to be non-functional timbers extend horizontally into space at either end of the building. Dowel holes around the doorway also suggest that a porch may have been present at some period. My knowledge of timber-framed buildings is, at best, extremely limited. Photographs of the building now rest in Barnet Museum if anyone feels they can comment further on the structure. Having found the building and its associated curios after five months' research, I then hoped, without much optimism it must be said, to be able to track down its original location. The present owners informed me that Gerald Gardner claimed that it originally came from Suffolk, so I once again contacted Mr. C. Williamson to see if by chance he could throw any light on the situation. It transpired that Gerald Gardner had in fact offered to sell the cottage to Cecil Williamson in the 1940's as his coven was having trouble getting off the ground, so to speak. For various reasons Mr. Williamson had to decline to buy, but did in fact visit New Barnet to enquire about the origins of the building. He was told (the 1940's) by manual workers on the site that the building had arrived as dismantled baulks of numbered timbers which were dumped and lay around for many months before reassembly. He was also told that the timbers came from a large farm on the outskirts of Ledbury in Worcestershire, where it had been used as an apple store. This all sounds plausible enough, although it must be pointed out that there were several timber-framed buildings present in the Abbey Folk Museum, and the manual workers may have confused them. It is difficult to check such details after sixty years or so, although it may yet prove possible. * Since completing this article, I have identified the signature as that of the late James Laver CBE, Keeper of the Dept. of Engraving, Illustration, Design and Paintings at the Victoria and Albert Museum, 1935-1959. The witch's cottage must be one of the most well-travelled buildings in England, and could well be on the move again some time in the future. The question of preservation is a somewhat vexatious one. As it stands, the building is now merely a C16 or C17 timber frame with no local connections other than those described in this article. It is, however, its associations with famous 'occult' personalities and events which make it particularly intriguing for those of us who are interested in such matters. It is therefore unlikely that any museum would be interested in displaying it, as the scholarly study of the history of magical practices is, unfortunately, very much a minority one. I could be wrong of course. What do HADAS members think? 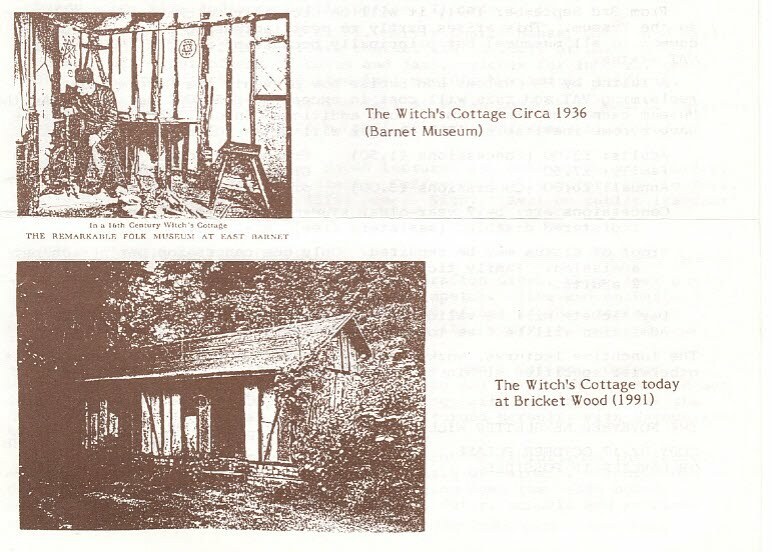 Should the witch's cottage again be transported to another location, it is hoped, at least, that a copy of its newly-documented (though, admittedly in parts, tentative) history will accompany it on its travels. Devon EX16 7NY. Telephone enquiries (STD 03986) 305. Desmond Collins has just published a new study arguing the case for an evolutionary model of human history. It presents a scheme of stages of cultural organisation and gives examples of their usefulness in two fields - demography and units of social organisation. A fascinating insight into the implications of English architecture as social history, using buildings as historical evidence. The development of houses in Hertfordshire is traced over six centuries in both fieldwork and old illustrations. Comparatively few of the buildings examined conform to established types; characteristically they are the result of piecemeal development, something which is equally true of manor and vernacular houses. The large number of engravings and drawings of buildings either demolished or greatly altered permits generalisation about the county's architectural history to an extent impossible from surviving buildings alone. From 3rd September 1991, it will be necessary to charge for admission to the Museum. This arises partly to meet increasing costs (a problem common to all museums) but principally because of a recent change in our VAT status. Annual: £6.00 (Concessions £3.00) . Concessions are: 5-17 year-olds, students, registered unemployed, registered disabled (assisters free), over 60s. Proof of status may be required. Only one concession per person per admission. Family ticket admits 5 people, with a maximum of 2 adults. Day tickets will be valid for return visits within three months. Admission will be free to the Museum after 4.30 pm daily. The lunchtime lectures, workshops and special events remain free, unless otherwise specified within the Events leaflet.